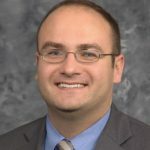 Jared Welehodsky is a senior policy analyst in the Policy and Innovation Division of the Michigan Department of Health and Human Services (MDHHS). Jared is responsible for policy research and development for MDHHS. In addition, Jared coordinates strategic initiatives at the direction of MDHHS leadership. Jared has worked for MDHHS since 2015. Prior to working at MDHHS, Jared worked in the Michigan State Senate for five years. Jared has a B.A. in Political Science from the University of Michigan-Flint and a J.D. from Thomas M. Cooley Law School.